One of Lake Norman’s best waterfront home sites (lot) is for sale. This 0.63 acre pie shaped lot sits at the end of Bluff Point Road on a Cul-de-Sac minimizing traffic. Its Cornelius address, close proximity to Birkdale Village, convenient commute to uptown Charlotte, sunset views and main channel location make it a very rare lot. Additional property features include mature trees, custom pier with covered floating dock, boat lift, seawall and swimming cove with area for your very own sandy beach. A small home built in 1979 sits on the property. At about 2300 square feet of heated living area the home offers hardwood floors, stone fireplace and an updated kitchen with granite counter tops. With the great value of this rare lot in a prime location one might choose to tear down the existing home and build a new custom designed luxury home. Several older homes on this street have already been torn down and replace by beautiful new custom homes. Call us today for a private showing or additional about this listing. Call Craig LePage at 704-618-2412. Absolutely nothing was left to spare with the building of this exceptional home. This custom luxury design mimics authentic European architecture as it was passed on from generation to generation. The incredible detail applied to this home makes it one of the finest homes ever built on Lake Norman. A MUST SEE! Way too much detail to list….. In a recent article on Yahoo.com and MarketWatch.com ranks Charlotte, North Carolina area the #1 place to live and relocate to in the United States. The rankings of the top 100 cities were released by Relocation-America.com and were based a number of different researched criteria. Rankings are based the strength of a cities real estate market, the area’s growth, the economy, its educational and employment opportunities, crime rates as well as environmental aspects such as climate comfort, water quality, air quality and the strength of its recycling efforts. According to President and CEO of HomeRoute and Relocation-America.com, Charlotte is getting flooded with interst from all over due to its strengths and the opportunities that it offers its residents. Stonecroft is a beautiful Golf Course Community South of Charlotte. Homes range from the $900’s to $2 Million and sit of beautiful home sites ranging from 0.3 to 0.85 acres. If you are a golfer or just enjoy the beautiful lanscapes they offer, Stonecroft is deinitly worth looking into. The Southpark community is conveniently located just minutes from the heart of downtown Charlotte. This gated community offers its residents mostly Old World and Traditional style homes on home sites that range from 0.3 to 0.6 acres in size. CHARLOTTE, NC & LAKE NORMAN AREA GOLF COURSE COMMUNITIES…. Piper Glen TPC (High $300’s to $4.5 Million) Piper Glen is one of the finest Golf Course Communities in the entire Charlotte area. Its spectacular large wooded home sites offer beautiful luxury homes by some of Charlottes leading luxury home builders. Piper Glen is located just south of the Charlotte city limits. Established in the early 1990’s the community still offers some stunning home sites as well as home just a few years old. Springfield is a beautiful golf course community located in Fort Mill, South Carolina just south of Charlotte. This well known community hosted the 2006 Home-A-Roma luxury home show and offers a variety of custom homes ranging from the high $300’s to just under $2 million. If you are looking for a luxury home community with plenty of amenities in fairly close proximity to downtown Charlotte, Springfield just might be the place you are looking for. Search for Luxury Homes by Town around the Charlotte area. We have broken down your search into towns to make it easier to find what you are looking for in particular areas. If you are not familiar with the Charlotte area it can be very confusing when searching for a home. Visit www.YourCharlotteLuxuryHome.comfor other custom searches such as Gated Communities, Golf Course Communities, Waterfront Homes, Equestrian / Horse Friendly Communities and much, much more. The Preserve at Windsor Pointe when completed will be one of the most extravogent waterfront communities on Lake Norman. This exclusive private keypad gated community will include six large stunning waterfront home sites and three off water home sites. The Park Creek Custom Home Community is located on the outskirts of Davidson, North Carolina. This Gated Community offers over 200 home sites on over 230 acres of wooded landscape. The community itself is surrounded by acres and acres of farmland making for a very peaceful environment. Some of the area’s finest home builders have signed on to build at Park Creek and new homes are ready for purchase today. Heydon Hall ($600k to $2 Million) South Charlotte Area Heydon Hall is a beautiful gated community in south Charlotte just minutes from the nationally recognized PGA Quail Hollow Golf Course. Its privated setting and stunning homes offer its residence a feeling of community and safety. With homes averaging in the 4000 square foot range, Heydon Hall offers high quailty luxury homes without having to purchase such a large home. Stratford on Providence is a stunning gated luxury home community conveniently located off the ever popular Providence Road in Weddington. Residences of this posh community enjoy beautiful natural common areas, large home sites and elegant home designs. If you are looking for a prestigious gated community conveniently located with the privacy of large wooded home sites, Stratford on Providence may be the place for you. Meadowbrook Farms is a unique Enclave of Luxury Homes in Huntersville just 10 minutes from Lake Norman. This private gated community offers custom built luxury homes on large lots over five acres in size. If you are looking for stunning homes, large home sites, a private gated community close to shopping, restaurants and the fun of Lake Norman then Meadowbrook Farms is the perfect solution. West View is a beautiful gated luxury home community located in Mooresville. This soon to be prime location is where the Langtree at the Lake community village and new exit 32 off of route 77 are currently being built. 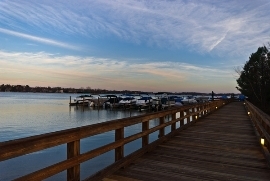 These large home site waterfront homes are unique to the popular east side of Lake Norman. Woodhall is an elegant gated equestrian themed community in Waxhaw, South of Charlotte. Residents enjoy large home sites ranging from one to two acres in sizes as well as a number of different amenities for the whole family to enjoy. If you are looking for prestige, gated privacy, large home sites and beautiful homes, Woodhall is a community you should take a look at. Sedgefield is a beautiful gated community in Waxhaw south of Charlotte. This Private Gated Luxury Community offers stunning homes on large home sites. Residents enjoy the tranquil sites around the community pond and heavily wooded home sites. Prices at Sedgefield range from $900k to $5 Million.